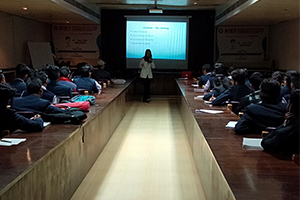 The Training & Placement Department, RIET, Jaipur organized an expert talk on 28th January, 2019. 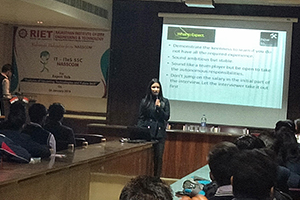 The topic on the event was, “Interview facing techniques and public speaking”. The main speakers on this occasion were Ms Sidhisha Singh & Ms Aishani Koushik Gupta who are internationally certified soft skill trainers. Dr Saroj Hiranwal, Principal RIET, welcomed the guests on this occasion. The other dignitaries present on the occasion were, Dr Sachin Sharma, Vice Principal, RIET and Prof D D Johri, Advisor T&P and Dr Monika Shekhawat, HOD MBA & T&P Officer. This session was attended by all HODs, faculty members B.Tech students of IInd Year, IIIrd Year and Final Year of RIET, Jaipur. Dr Saroj Hiranwal, Principal RIET, said that in dynamic nature of present scenario of industry working culture, the process of hiring technical personnel are changing at a rapid pace. The course curriculums of the universities do not completely fulfill the industrial requirements in terms of soft skills and public speaking. Prof D D Johri, Advisor T&P cell said that the best way a speaker can ensure that his message is communicated effectively is to consider his audience and their biases and beliefs. Getting to know and understand the audience will help to create a speech that carries meaning. 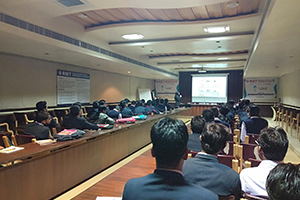 He also said that the expert talks of this kind help students to be aware of various requirements in the industry. This is helpful for faculty members also as they come to know about the current necessities and trends of the corporates. 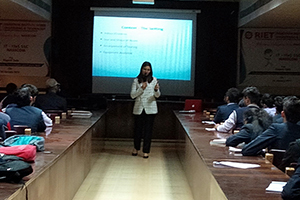 Ms Sidhisha Singh, internationally certified soft skill trainer an internationally certified Soft Skills Trainer and an Image Consultant trained under the curriculum of world’s pioneer image master “Judith Rasband”(CEO and Director of conselle institute of Image Management, USA) in collaboration with “Image Consulting Business Institute” said that Public speaking is the process of communicating information to an audience. It is usually done before a large audience, like in educational institutions, the workplace and even in our personal lives. The benefits of knowing how to communicate to an audience include sharpening critical thinking and verbal/non-verbal communication skills. Ms Aishani Koushik Gupta, a highly acclaimed internationally certified trainer in this field. An English Graduate and a post graduate in Event Management and PR with working experience of 2 years in Event-you-all, Bangalore. A certified Soft Skills Trainer and an Image Consultant certified by “Image Consulting Business Institute” under the curriculum of “Judith Rasband”(CEO and Director of conselle institute of Image Management, USA). While speaking to the audience she said that, public speaking is important in both business, education, and the public arena. There are many benefits to public speaking whether you’re an individual or a business. Over the years, public speaking has played a major role in education, government, and business. Words have the power to inform, persuade, educate, and even entertain. And the spoken word can be even more powerful than the written word in the hands of the right speaker. The vote of thanks was extended by Dr Monika Shekhawat, HOD MBA & T&P Officer. 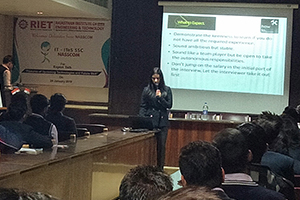 Speaking on the occasion she mentioned that this talk imparted an insight to the students as well as faculty members about the upgraded importance of soft skill so that the employability of qualified engineers may be enhanced. 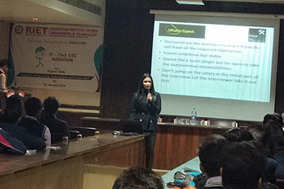 She thanked all the speakers for giving their valuable time and imparting this knowledge. She also said that TPO RIET looks forward to many such occasions.